WINNING TEAM WINS $200, CHANCE TO WIN $5000. 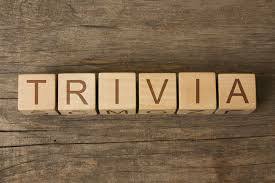 If you fancy yourself as a bit of a trivia buff and know your way around the World Book Encyclopedia, come on down EVERY THURSDAY for our trivia nights. This is a fun night out for all ages and kicks off at 6.30pm. If you are a local sporting, community, school or charity group, this is a wonderful opportunity to fund raise…..if your team wins donate your winnings to your group! It’s that easy. Terms and conditions available at the bar.